We are offering Flexi Tank to our client. Our group is promoted by Mr. K. B. Cooper a well known personality in the shipping circles, having over seven decades of expertise in shipping and specializing in Bulk Cargo Handling, Stevedoring, and Agency. He has won multiple accolades for services rendered in the industry. The company started its operations being the representative of Bickenstaff and Knowles a world renowned Carpet Auction House based in UK and headquartered in Switzerland. Amfico then got an opportunity to represent UK’s largest privately owned, specialist logistics company M/s Suttons International, having a network of offices and agents all over the world. Amfico-Suttons have been nominated by world renowned shippers and consignees and year on year have been winning some of their tenders. 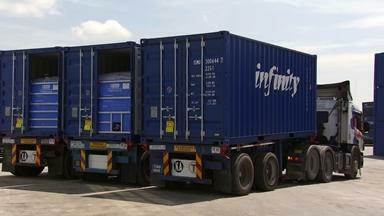 At present we are handling a significant number of tank containers in and out of the country. With a complete range of freight forwarding services, we leverage volumes smartly to deliver competitive sea transportation in every major trade lane between India and USA, European Countries, Middle East, Far East etc. Presently, under the leadership of the Managing Director Mr. Farhad K. Cooper, Amfico is now the All India Representatives of many International Companies ranging from composites and safety materials to coatings and cleaning systems for whom we provide a wide array of Services, Products and Business Solutions, giving them a smooth entry into the lucrative Indian Markets & ensuring that their product reaps rich dividends. We have an excellent team of professionals for each of the Services, Products and Business Solutions, with vast experience in handling the above operations. We remain dedicated to keep our Clients, Business Partners & End Users updated with the latest developments as it happens. We believe in protecting the interest of the principals very efficiently, cost effectively and by giving them timely and accurate feedback. Amfico has recently set up its own state of the art ISO Tank coating facility near Nhava Sheva Port. Our applicators have been thoroughly trained and vetted every year. India is one of only three countries where Advanced Polymer Coating where they have a certified coating facility.